Olive orchard maintained by Olivino on mountainous terrain. We harvest by hand and irrigate sparingly with water from our own sources. 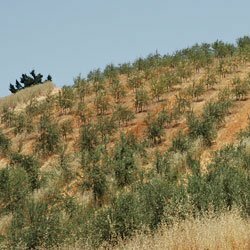 Olivino, Inc, provides a variety of products and services for the olive and wine industries in Northern California. Founded in 2004 by Italian, Swiss, and American partners, Olivino brings together traditional know-how, precision technology, and a determination to excel in quality and service. Olivino's management team combines decades of experience in agriculture, ranching, land conservation, manufacturing, business management, finance, and marketing. Every member is also a down-to-earth green thumb with a passion for growing and nurturing plants and trees.